With mid-summer a little slow on the birding front in Beijing (the heat, as much as anything, makes birding uncomfortable), I decided to use the opportunity of a free sunday afternoon/evening to check out the local Common Swift (Apus apus) colonies in Tiananmen Square. The subspecies in Beijing is pekinensis and it is a common breeder in the old-style buildings and hutongs, exploiting gaps under tiles as nesting areas. 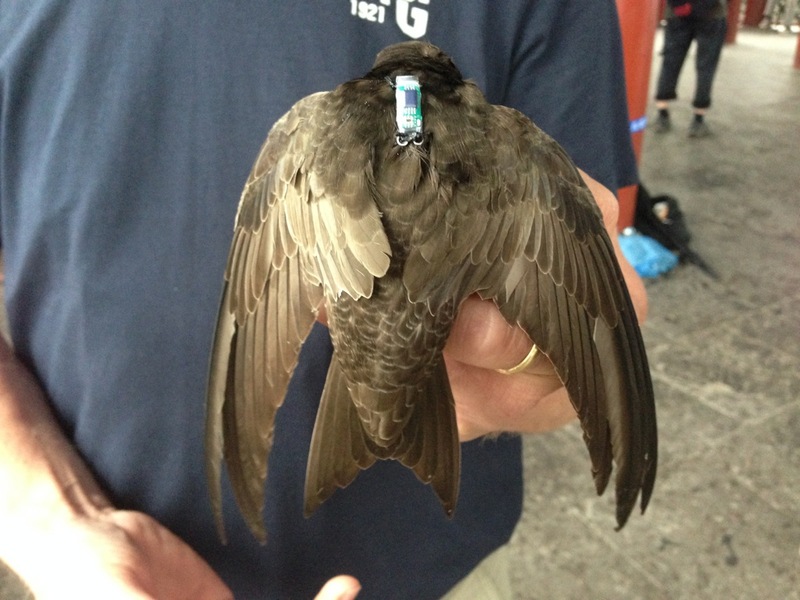 They supposedly winter in Africa with the nominate Common Swifts from Europe (I don’t know if this has been proved through ringing recoveries – comments welcome). 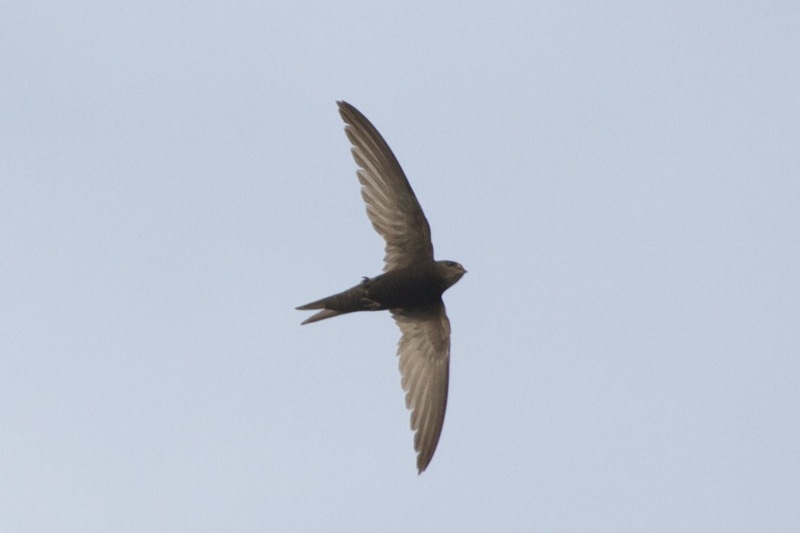 In Beijing the only other swifts frequently seen are the Pacific Swift (Apus pacificus) and, on passage, the very different White-throated Needletail (Hirundapus caudacutus). Neither should cause any identification problems. The pekinensis subspecies of Common Swift is a potential vagrant to Western Europe but, for me at least, picking out one would be challenging. 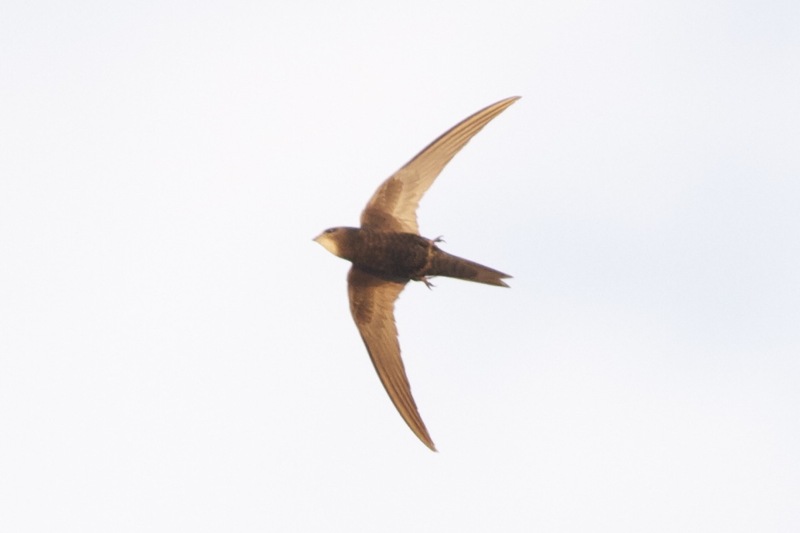 There has been some discussion of this possibility before and, I think, a few papers in the various birding journals, some of which warn of possible confusion with the similar Pallid Swift (Apus pallidus). So it was with this in mind that I went to check out the pekinensis swifts at Tiananmen. The first thing I learned was that they are variable and that the same individuals can look quite different in changing light conditions. Although structurally the pekinensis birds look like the nominate Common Swift, some exhibit plumage characteristics (e.g. 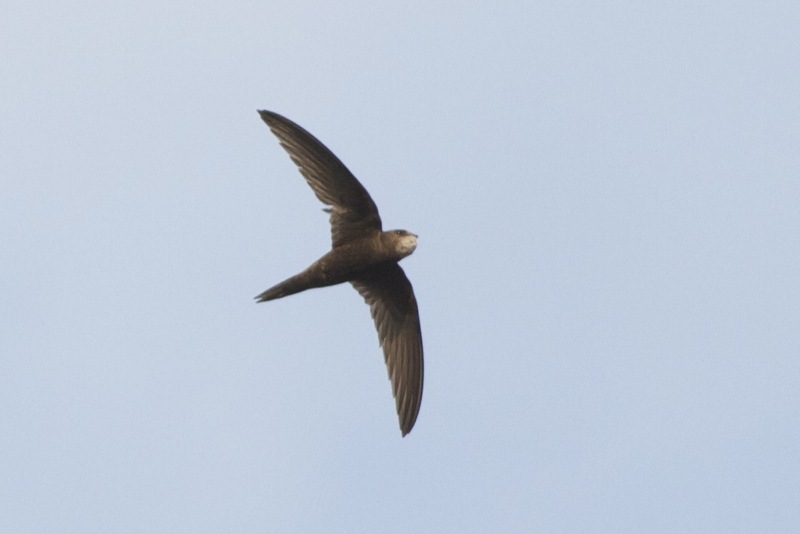 a dark eye mask, ‘cold’ tones, a dark ‘saddle’) that, in a European context, might suggest the closely related Pallid Swift if only brief or distant views are gained. Anyway, here are a few images from Sunday evening with some personal comments. Common Swift ssp pekinensis, Beijing. 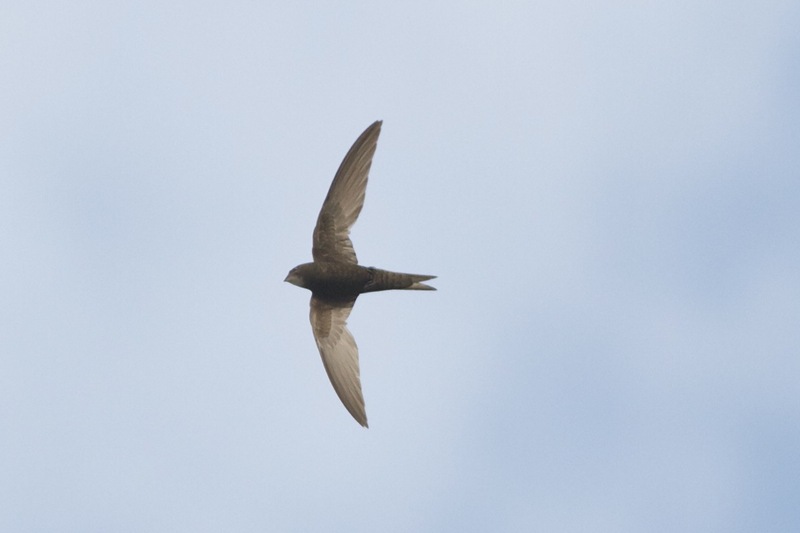 Typical Common Swift structure with ‘scythe’-like wings and a relatively deep fork to the tail. Note also the contrastingly dark underwing coverts. 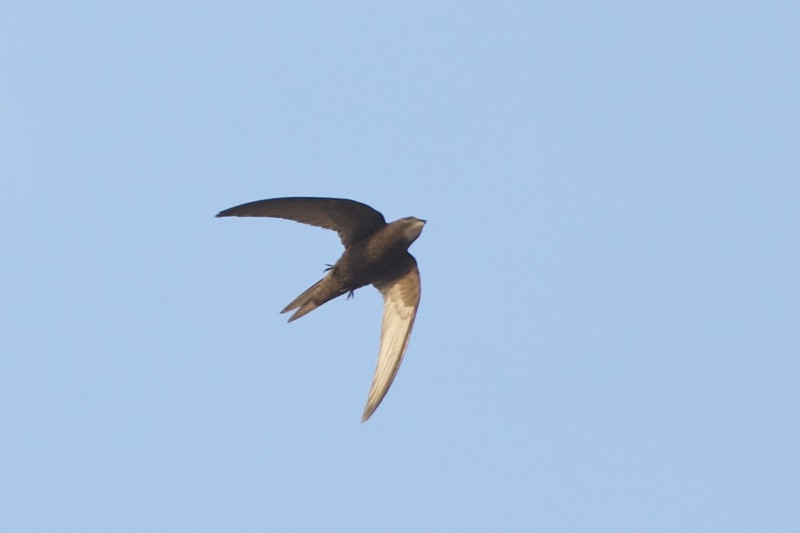 Common Swift ssp pekinensis, Beijing. Again, note the contrasting dark underwing coverts. The white throat patch contrasts with the side of the head. Common Swift ssp pekinensis. 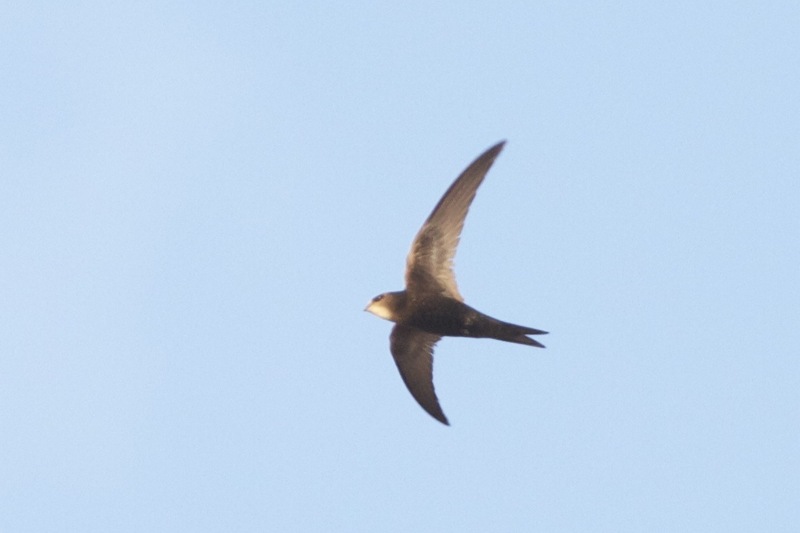 This individual shows quite a distinctive dark eye patch, reminiscent of Pallid Swift, and a strong pale throat patch. Common Swift ssp pekinensis. Again, showing a dark eye mask but with dark underwing coverts and light ‘scaling’ on the underparts. Note that many birds flew with trailing feet.. I wondered if that was a reaction to the heat? Common Swift spp pekinensis. This individual appeared darker overall and with a less obvious throat patch. One thing I learned – these birds can look quite different in changing light conditions. Another observation from Sunday was the variability of the white throat patch, linked to the crop. Compare these two images of two different birds in similar flight positions – one with a full crop, the other with an empty crop. Striking! Common Swift ssp pekinensis with full crop. Note the striking pale throat. Common Swift ssp pekinensis with empty crop. In conclusion, if seen well, these pekinensis birds should not cause major confusion with Pallid Swift. The combination of structure and plumage (relatively narrow scythe-shaped wings, slim body, relatively deep forked tail combined with dark underwing coverts, ‘warm’ plumage tones and a lack of an obviously dark eye mask) should be enough to make identification relatively straightforward. But beware that, in some light conditions, some pekinensis Common Swifts can display one or more Pallid-like plumage features! However, picking out a pekinensis among Common Swifts, or identifying a single individual in Western Europe in late autumn is another challenge and one I would not be so sure about meeting! Finally, at one point on Sunday all of the swifts suddenly stopped wheeling around the Qianmen Gate at Tiananmen and gained height fast. 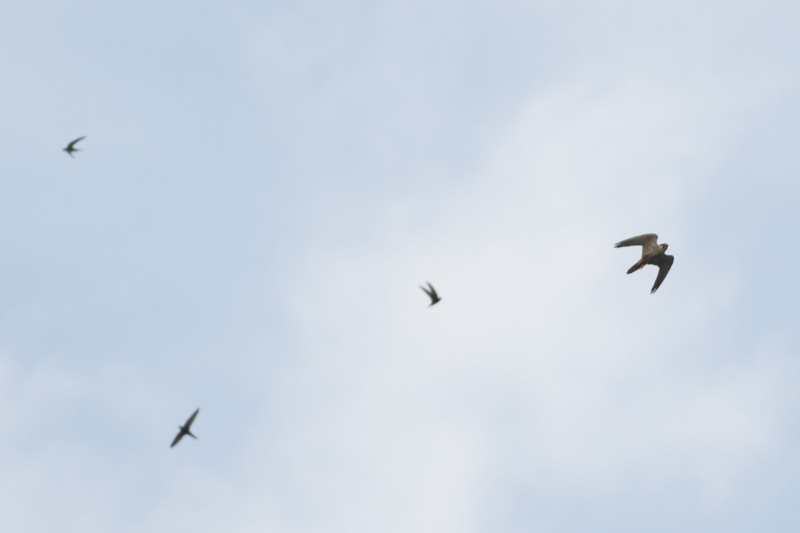 The reason was this Eurasian Hobby that suddenly appeared and started to hunt the swifts over Mao’s mausoleum! 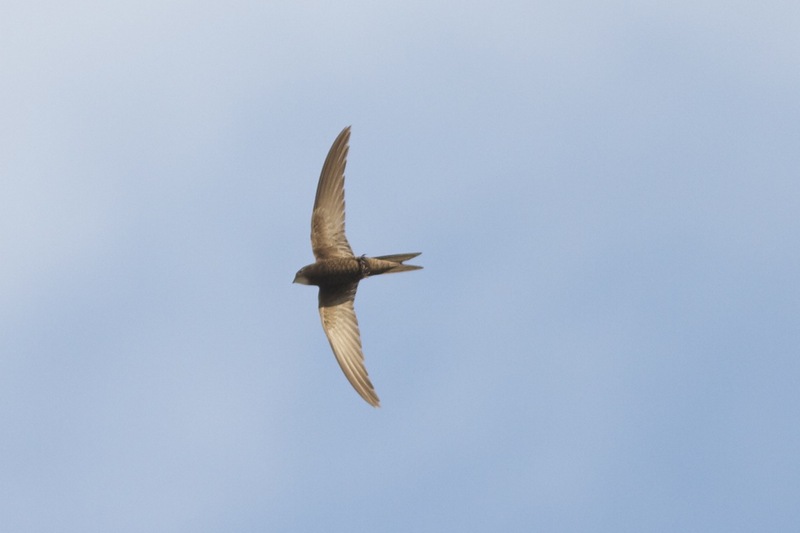 It made a couple of half-hearted attempts to chase a swift but, after a couple of minutes, it drifted off west and the swifts returned to lower altitudes. Hobby hunting Common Swifts in Tiananmen Square, Beijing.